Ocean City is in the middle of a watershed town election campaign. More candidate signs all over town than I ever remember seeing before. The mayor and four council members will be elected on Tuesday, Nov. 6. This is the first time Ocean City’s nonpartisan town election will be held on the same day as a national election. Many hope this change will result in more voters participating in the town election. I don’t want to get involved in the personalities or issues. Suffice it to say that economic hard times put pressure not only on families and businesses, but also on government, perhaps most of all at the local level. Revenues from all sources go down and budgets need to be cut. It’s never easy. In recent years, the Ocean City Council has been divided into 4-3 majorities. The big issues in the present election are the town budget and taxes, the morale of town employees, and the future direction of Ocean City. The election will determine who holds the Council majority for the next two years. It looks like, whatever the outcome, we’ll have another 4-3 majority, or possibly a 5-2 majority. One unusual factor in this election is that one of the candidates is a former city manager, Dennis Dare. Four incumbents are battling for re-election, two each from the present majority and minority. The former president of the City Council, unseated two years ago, is making a comeback bid. And there are two or three other hopefuls in the race. Also on the local ballot, a question: should town employees be allowed to form a union, or not? The Police Department is already represented by the Fraternal Order of Police. I happened to run into Mayor Rick Meehan in a West Ocean City fast-food restaurant today. He was eating lunch by himself, so I stopped by his table. This is what small-town life is like. I think he’s feeling the strain of the political unpleasantness, which I hope will soon be over. I didn’t want to trouble the mayor about the election, but I did have a question about the work that’s been started to draw up a new strategic plan for the resort. Mayor Meehan explained that a consultant has started interviewing town employees, and will soon interview council members. Public meetings will follow allowing input from the community-at-large. We chatted about it briefly. The strategic plan will address not only the workings of the town government, but also the local economic situation and the general direction of the town going forward. It’s a very important time not only for the town of Ocean City, but also for the Greater Ocean City area, which includes West Ocean City, Ocean Pines, and South Point. This is the first time Rick Meehan has an opponent in an election for mayor. 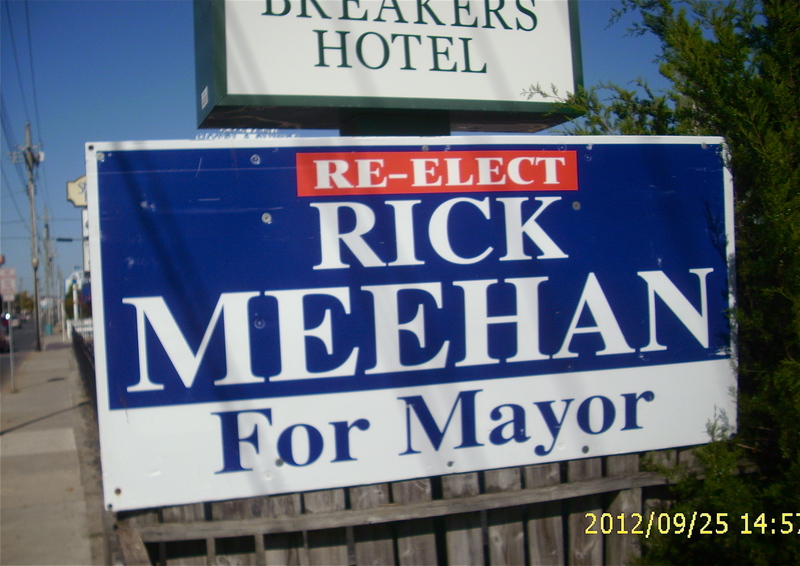 I think everyone expects Mayor Meehan to win re-election handily. He’s done yeoman work for the town over many years, and in the past year he picked up the extra work of serving as interim City Manager for 10 months. I wished him good luck in his own election, and also that political tension in the town will soon ease.